Planning end-of-year giving campaigns can sometimes seem like a double-edged sword. On one side, there is the huge potential for nonprofits that often comes with the end of the year givng frenzy. It is consistently one of the busiest time for nonprofits and many organizations see a majority of their donations come through in the last few months. On the other side, however, is the risk of putting too much stock into end-of-year campaigns. If a majority of your annual goals are focused around a single day (looking at you, #GivingTuesday) or a specific period of time, it can make planning for and executing on these campaigns stressful. This is why the number one rule of end-of-year giving is to spread it out throughout the year. Don’t let your campaigns pile up until you’re just running them all at the end of the year. Spread the love throughout the entire year so that donors are pleasantly engaged for months at a time — not bombarded with content all within a two-week period. This way, donors are more inclined to engage with (and donate to) your cause when it comes to year-end. While your team is planning out your amazing end-of-year campaigns, just remember that nonprofit groups around the world are doing the same exact thing, and they’re targeting the exact same timeframe. Planning early, setting up your goals and campaigns, and communicating with donors can help get your message in front of audiences in the crowded year-end appeal craze. Instead of trying to shout to be heard above the noise, your team can calmly engage with donors like you would during the rest of the year — just with a more targeted message to spur donations during the giving season and instill a sense of urgency. It may seem like the star of the end-of-year giving season now, but #GivingTuesday wasn’t even around until 2011. It’s position after Cyber Monday at the end of the busiest shopping weekend of the year makes it a go-to campaign for nonprofits looking to hone in on the public’s sense of charity and engagement. To ensure your #GivingTuesday campaign stands out from the rest of your end-of-year events, create a dedicated online donation page or microsite that includes all relevant timelines, details, goals, and information, including a donation link so they can easily give via their payment of choice. For today’s mobile-savvy audience, also consider adding in a way for charitable givers to text-to-donate. It’s also a good idea to include social media #hashtags to help donors share your nonprofit’s cause and goals with their networks for maximum donations. Your organization can truly maximize incoming donations by having a strong communication strategy in place across all channels, such as email, direct mail, advertising, PR, traditional media, and especially social media. Engage directly with donors who have shared their story of why they’re partnering with your nonprofit, along with a personal link requesting new donors to get onboard with the cause. Build a peer-to-peer network of like-minded donors who can share ideas and stories about your organization. This can create a type of grassroots communication initiative that will help your organization thrive well beyond the end of the year. End-of-year giving doesn’t have to be (and shouldn’t be!) a one-time thing for your donors — in fact, by communicating effectively, you can help your nonprofit build lifelong relationships. At the end of the day, maximizing donation potential requires taking advantage of the right solutions at the right time. From tracking donations and campaign goals to communicating with donor audiences to driving new technological solutions like text-to-donate software, the right nonprofit fundraising platform can make all the difference. Having a single solution that drives most of your campaign logistics can also help from a reporting perspective. Planning for future campaigns is easy when you have the metrics from past years readily available. 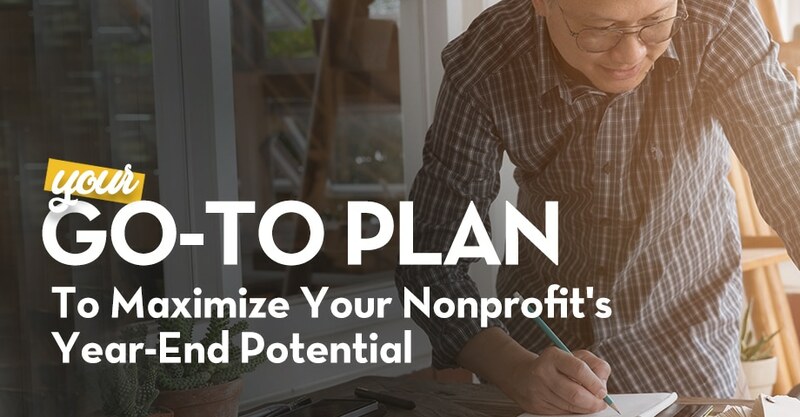 Look for one that is inherently built for the nonprofit industry and that is designed to help your team improve engagement while also increasing donations. OneCause powerful fundraising solutions can help your team work smarter, streamline internal operations, and build a better donation experience for your audience. Learn more – take a tour of the OneCause platform today!